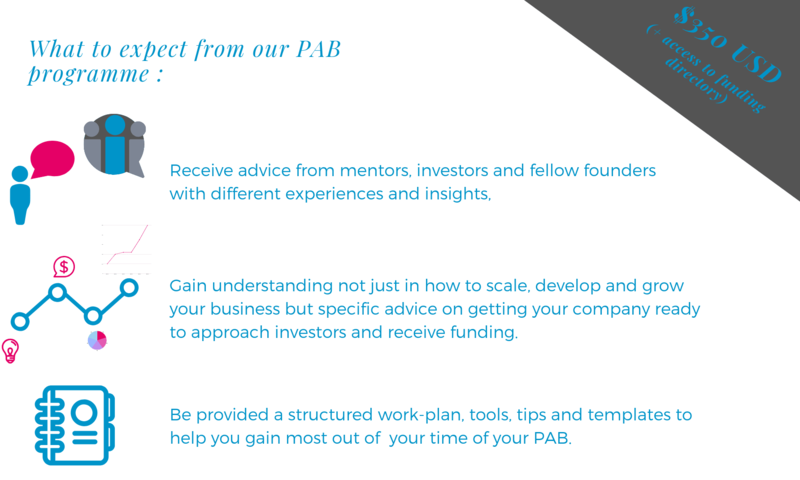 The purpose and aim of this programme is to group you with like-minded female founders who have the same business goals and intentions and are at a similar stage of their business as you. However, they might offer a different perspective than what you already have. Listening to your peers and fellow successful and goal seeking founders will allow you to explore new options or identify problems that might have been previously overlooked. 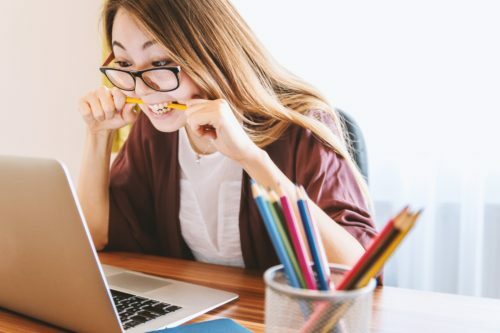 We all know the stresses of starting up a company, Next Chapter is a sole female-founded company and is constantly reaching out to peers for feedback and advice. When it is your own company it is easy to become attached and emotionally drawn to your project. Having an outsider’s perspective may add a whole new light to your business that you didn’t know existed. As many female founders are sole founders, a peer advisory board can provide an opportunity to discuss ideas, issues or wins in a supportive and positive environment. Prepared to agree to “Chatham House” rules of keeping all information discussed confidential. HOW WE SELECT AND GROUP FOUNDERS? Each application is reviewed and detailed analysis and matching process occurs to ensure you are paired with founders who match your goals and have a similar level of business maturity as yourself. Groups are also reviewed to ensure no business overlap or competition which could cause conflicts. Consideration is given to investor expertise and industry focus in selecting entrepreneurs. As we have limited spots available, not all applicants will be successful. However applicants can work with Next Chapter to reapply for future PAB cohorts. What makes our programme different to one-off networking and coffee catch-ups with fellow female founders?, We have invited investors to give their advice to your business as well so you can see if funding if the right next stage for you or, if this is already your goal, how to achieve it and be confident and prepared when approaching investors. 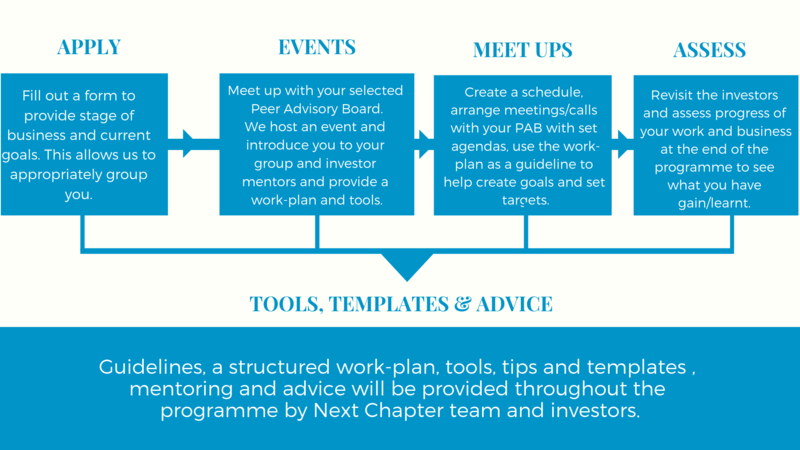 As part of the programme we provide a guided work plan and templates/worksheets to help you make the most of your meetups and make sure you are achieving your intended goals. 1) Gain access to our directory and discover over 250 female-focused funding organisations; view their funding focus, application process and special reason ‘why we like them’. Female-led businesses looking to grow their business through increased funding. Who want to learn and understand their options better and seek connections with funding organisations and investors. Each founder has different needs, wants and expectations around the capital they are looking to source. Often they are starting from a point of limited contacts or knowledge related to funding. Also from both the Founder and Investors viewpoints there is no one type of funding or capital that fits all so finding funding can be a time-consuming process. We understand how hard it can be to launch and run a business. Therefore our vision is to build a community of networks and partnerships with other organisations, so that female entrepreneurs gain access to the capital and other resources they need to launch and grow successful businesses.